AMC's hit series Better Call Saul just wrapped its fourth season on air, and fans are surely dying for the next season after that finale cliffhanger. For those who haven't had the chance to catch up, beware of major spoilers ahead as we delve into the things we'd like to see in Season 5. From Jimmy's (Bob Odenkirk) transformation to resurfacing characters, we're exploring many possibilities. A familiar transformation and more took place in the fateful episode. Below see the 5 things we want to see in Season 5 of the Breaking Bad spinoff. 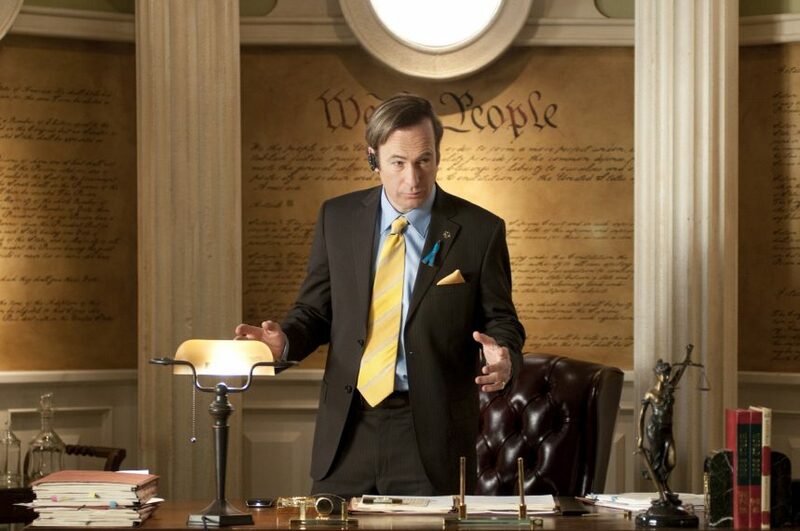 Fans who knew and loved Saul Goodman in the original series Breaking Bad saw Jimmy McGill return to this character he created in a prior season, but this time he's ready to serve the people... and himself. When it's revealed that Jimmy's appeal to practice law again is approved, his quick decision to work under a different name — Saul Goodman — proves that we're much closer reaching the point in time where Saul was introduced in Breaking Bad. Viewers caught that glint in Jimmy's eyes when he swiveled on his feet to face Kim and revealed his desired name for practicing law, and his statement during his appeal only proved what fans knew — Jimmy thrives in lies, and Saul's the person he becomes for that. So we're hoping/looking forward to seeing more of this in the next season. In a show that includes many characters from the original series that inspired the spinoff, Better Call Saul is reaching a point where Jimmy's timeline will intersect with Walter White's (Bryan Cranston). As those two characters became intertwined we saw more and more characters weave their way into the story and those are some of the people we're hoping to see. For instance, maybe some Hank Schrader (Dean Norris) action is a possibility — he and Saul both dabble in the law and the first time we see them interact is vague enough to imply that they may have met before. But Hank's just one hopeful appearance in a long list of characters we wouldn't mind seeing pop up on the show. We saw this "new" character interact with Mike (Jonathan Banks), Nacho (Michael Mando), and Gus (Giancarlo Esposito) this season, we'd like to see him cross paths with Jimmy. Thankfully this is more likely than not since the first mention we have of Lalo (Tony Dalton) was back in Breaking Bad indicating that some serious stuff will go down between the characters. Considering how fearful Saul was in Bad, we can't imagine that it will be anything good, but since we don't see him in the original series, we'd like to see how Lalo's story plays out. Will she stay or will she go? After the Season 4 finale, it's clear Kim (Rhea Seehorn) was one of the many people fooled by Jimmy's statement during his appeal, will she break that cycle? Fans know how Jimmy ended up — he became a quick talking Saul — but does Kim join him on that blurred line? She surprised us earlier in the season when she asked to help orchestrate some cons, but the sheer shock on her face as Jimmy revels in his success with lying makes us wonder if it's gone too far. It would be sad to see Kim and Jimmy part ways, but it may be her best course of action and we wouldn't mind seeing Kim take moral path in Season 5. As 'Better Call Saul' enters Season 3, we are taking a look at some of our favorite 'Breaking Bad' characters we want to appear on the drama along with Gus Fring. Similar to Jesse Pinkman (Aaron Paul) in Bad, Nacho is a character that you're rooting for to make it out alive. We did see that since his deal with Gus, Nacho has acquired a new set of IDs for him and his father implying that he's thinking about disappearing and we really hope he does. Unlike the other hardened criminals of the show, you can tell that Nacho wants to wash his hands of the business and he almost had earlier in the season. So, we're hoping Nacho has his great escape when the next season rolls around, but with Lalo around you never know what will happen.